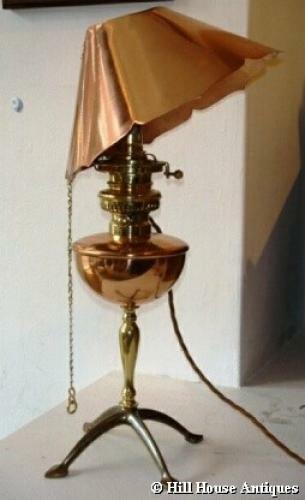 A rare WAS Benson copper and brass oil (now converted to electricity) reading table lamp on quadruped stylized feet and that all important original adjustable copper reflector. For reference see page 106 of the WAS Benson book. A brass version was shown at the Arts & Crafts Metalwork exhibition held at Blackwell in 2003, cat no. 17 on page 16 of the accompanying catalogue. Stamped marks. c1900.